Do Open Source Projects Need Foundations? - What Do You Care What Other People Think? Do Open Source Projects Need Foundations? The Linux Foundation. The Apache Software Foundation. The Perl Foundation. The Eclipse Foundation. The Mozilla Foundation. The Free Software Foundation. Arguably the six most successful open source projects (and collections) have their own foundations, and there are a number of others. Stephen Walli (his blogs are found here and here) recently quoted Henrik Ingo's research that shows the top 9 open source projects (measured by code contribution) are all housed in foundations. There are also notable exceptions, like PHP which has the PHP Group as a governance system but no foundation; however the PHP Group still acts as a legal entity capable of copyright ownership. 1) Small projects run by one or two people run into trouble when those people take jobs at major corporations. Who owns the project? What about the rights to the code when the committer is now working at a corporation? What if the company hired the person specifically to gain rights to the project? The project becomes a chattel, regardless of whether it has many users and many opportunities beyond what the corporation wants to see. 2) Corporations or individuals who want to "donate to the project" cannot do so directly; they can take the risk of donating to the individual developers but there is no way to ensure that these donations will be applied purely to the project. This not to say that committers can't be relied on to do the right thing, but that there's no standard legal agreement outside of a "work for hire" that can be used. The project can't be treated as a charity and the ownership of the work done under hire becomes questionable - is it owned by the donor corporation or the developer committing the code? What could be useful here is a system that enables projects to become legal entities more easily, so that the multiple influences of different corporations and individuals can be matched by the idea of "the needs of the project". You hear the term frequently within a company ("what are the needs of the company?") in a way that does not invoke "what are the sum of the needs of the employees?" This is important because the company itself has a mission, and decisions can be made in the context of that mission. Currently the creation of a non-profit foundation is expensive, requires significant time and overhead on the part of the founders and officers, requires skills ranging from legal to financial to everyday administration to ensure that national and state laws are followed to support non-profit operation. This seems inherently inefficient; there are many popular and useful open source projects that don't have the wherewithal to generate foundations, and are not sufficiently aligned with major projects like Linux, Apache, Perl, Eclipse, or Mozilla to be merged under their umbrella corporations. I am on the board of the Outercurve Foundation, which is one example of a solution to the problem laid out above. I wonder what other low-cost solutions exist for the sake of open source projects, what long-term legislative fixes might be made, and how many others observe the problems and opportunities I've described above. Thanks, Stefano. I hadn't run across the Software Freedom Conservancy until now. Also, thanks for pointing out that I'd missed the FSF (via Twitter). Software Freedom Conservancy is a very good and appealing solution for small open-source projects, but (for what I have understood from their web-site) their benefits only apply to USA citizens, right? what about non USA citizens? 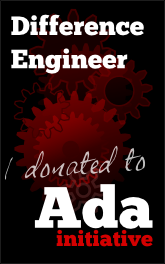 Donate to the Ada Initiative’s Seed 100 campaign to support women in open technology and culture! and the triumph itself makes us small. does not want to be bent by us. like chords of deep music. that kneaded him as if to change his shape. Winning does not tempt that man.